This post is inspired by a recent piano tuning job in the Crosspool area of Sheffield which reminded me of have much I enjoy working with the magnificent Yamaha U3 – and the Yamaha U1 for that matter! A favourite amongst professional pianists, recording engineers and piano-collectors alike, the Yamaha U3 is an incredibly impressive piano signifying numerous advances in piano technology and setting new standards of construction in the industry. Even if you haven’t heard of the model, you will recognise its sound – many high-profile musicians insist on using this piano (as heard on countless pop songs). Speaking as a piano tuner, one of the remarkable things I have noticed about the Yamaha U series is how little variability there is between each piano – every U3 (or U1) I have tuned in Sheffield has been very similar in tone and touch. While other manufactures have out-sourced to China, Indonesia or Korea (to cut costs at the expense of quality), each U3 piano is made in the hamamatsu factory in Japan, renowned for their consistently high build-quality. The bridge, soundboard and ribs are made of the highest quality hard woods, ensuring strong tuning stability (every one I have tuned has been close to concert pitch for this reason, even when neglected for a few years). If bought new it’s likely to last a generation without needed much in the way of repairs and the tuning (particularly the unisons) will still sound extremely close even six months after its last piano tuning. Although almost identical in construction, the Yamaha U3 has a slight advantage over the U1 – mainly in its size. The U1 stands at 121 cm, while the U3 is a towering 131 cm. The larger cabinet allows slightly longer strings to be installed and gives extra room for a larger soundboard, resulting in a richer, warmer tone. 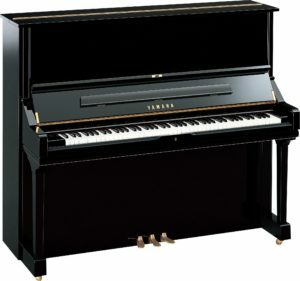 If you thinking about spending a large amount of money to upgrade to a first-rate piano, perhaps the extra money would not be too much of a stretch and the U3 might be worth investing in. Either way, they are both beautiful-sounding pianos that are a joy to tune, regulate, repair and play.